Jenny is a very lucky doggo. While she was out for a walk with her owner Joanna Hole, her lead got trapped in a car bumper and she was dragged 300m along the road. But miraculously, 11-year-old Jenny survived. 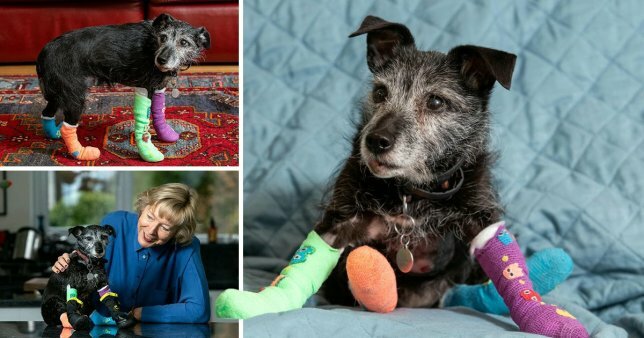 Now she has been left with brightly coloured bandages on all four paws as they were worn down to the tendon as she remained on all fours. Joanna said: ‘I couldn’t do anything about it. The lead was wrenched out of my hand and my poor little dog was dragged down the road. ‘I thought she was going to die. It was awful to see. It tore off the bottom of her paws. Her paws were so badly hurt. Her front paws were worn down to the tendon. ‘I couldn’t believe she stayed upright. It was like she was water-skiing down the road.’ Joanna, Fox Hill, Bath, said that a nearby cyclist saw what was happening and sped off after the car and the dog, weaving through traffic to catch up. The cyclist managed to get level with the car and motion to the unaware driver to stop immediately, just before the Hadley Arms pub – just yards from a roundabout. Joanna said: ‘She was in a hell of a mess. If they had not stopped the car, it would have driven over the roundabout and Jenny would have surely died. ‘The cyclist risked his life to get in front of the car and then bang on the roof to get the driver to stop. ‘So many people were screaming and shouting when they saw what was going on. A van driver stopped and directed the traffic, and lots of Ralph Allen pupils, who were amazing and so kind, came over to try to pet Jenny and calm her down.’ Joanna added: ‘A lovely lady, called Shelley, then took us off to Rosemary Lodge Veterinary Hospital down the road to treat her injuries. ‘It was just horrific. I was sick with dread.’ Jenny was kept at the vet hospital for two nights, and has had to return every day for bandage changes since she was discharged last Wednesday. She added: ‘This was a miracle from Rosemary Lodge. They have been fantastic, I cannot thank them enough. ‘They took Jenny out of my arms and straight into the operating theatre. The team was just remarkable. ‘There were really a number of exceptional people who helped out Jenny. The cyclist was amazing. ‘I was pretty shaken up, I didn’t cope with it very well. I keep reliving the whole thing. I feel a bit better now but I felt powerless then.’ She said that she had no ill feeling towards the driver, who had no idea what was happening. The poor man was in a more worried state than me. He was trembling and was very tearful,’ said Joanna. ‘He told me he was a dog owner as well and felt just dreadful. He did not know about it. 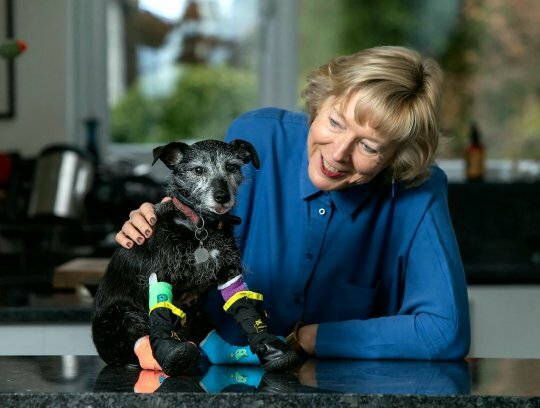 It was just an unfortunate accident.’ Joanna said that Jenny is still ‘very floppy’ after almost a week on morphine – but that her dog is ‘very, very lucky’.